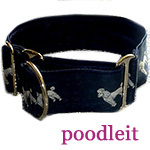 Poodle Blogger: Cold Weather Craziness! feet, legs and even ears--this is one of the biggest breed differences I have experienced. Siberians play in the snow, give themselves a shake and are practically dry. But it takes a lot of work to get the ice out of a Poodle who just went for a snowy runaround in the backyard. No way can you just ignore the snowballs--that would be like inviting a frozen Alpaca into your houes and allow it to defrost while it camped out on your sofa! I have only one Siberian left now, but cool weather craziness is obviously not just a breed related trait, because the poodles and the mutts exhibit this same burst of energy as Siberians when the temp drops. They have absolutely no respect for the fact that my aches and pains make it no fun for me to go outside in cold weather. Dogs that were originally bred to work (remember that the Standard Poodle was developed as a water retriever) are typically endowed with a hardiness that allows them to handle cold weather even better than hot weather. 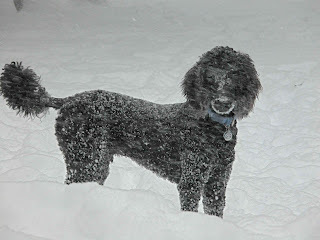 Of course there are short coated breeds and tiny toy dogs that do not want to go outside in the cold, but I have found that my Poodles enjoy going outside for a good romp, even in the snow. Rain is another matter (they will "hold it" forever before going outside in the rain for a potty break) but cold and snow doesn't bother them a bit. For those of us who do not enjoy the cold weather, we must be creative in thinking of ways to help our dogs expend the excess energy. Even if you have to use your Christmas money to buy a warmer coat for yourself, if your dog is used to daily walks, then you need to continue this routine as often as weather permits, or leave your dog at a doggie daycare during the day so that he is already well exercised when you pick him up after your work day. What about treadmills? 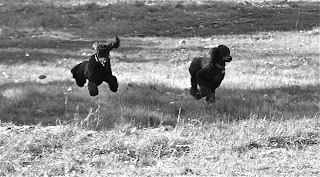 Poodles can be taught to run on treadmills, but dogs, just like human beings, find walks outdoors much more rewarding than treadmill exercise. Think of all the smells and sights your dog misses when he doesn't get to take a long walk with you, or play with other doggie friends outdoors. If you find that your dog is still amped up and ready to go even after you have suffered through a walk in freezing weather and are ready to warm yourself in front of the fireplace, then put up your coat and take a Kong toy out of your freezer. Kongs in the freezer? Sure, they are a great way to keep a dog busy. Buy at least three of toys designed to be "stuffed", fill them with your dog's kibble mixed with a few of his favorite treats, then cap them off with cream cheese and place in a ziplock bag in the freezer section of your fridge. You can find Kong toys and a great selection of healthy treats in our Knowing Dogs Amazon Store. Freezing the stuffed Kong makes the cream cheese harden, so it will take a bit longer for your dog to get through it, thus the fun of the toy will last longer. You can clean them with a bottle brush, or simply put them in the dishwasher to clean before re-using them. Chewing is actually good "exercise" for dogs, so the stuffed chew toy serves two purposes--keeping your dog busy so you can relax in the evenings and helping him expend excess energy. Do you have other cold weather advice for Poodle owners? Perhaps you have developed indoor exercise games, or you have tips on how to get those snowballs out of a dog's coat? Curious minds want to know--please leave a comment to share with our readers!